A group of three scientists says they've found the best place to look for indication of ancient life on Mars — one of the youngest lake-bearing basins ever revealed. However Mars has no liquid water today, the planet was flooded with massive oceans billions of years ago. And as we all know where there's water, there's the potential for life. Researchers think that after the oceans vanished, that wasn’t just the end for water but for life also. But a new research paper issued in the journal Geology says that's not the case. Mars had a second reservoir of surface water nearly 3.6 billion years ago — 200 million years after researchers thought Mars had hosted the last of its liquid water. This water, the scientists report, was found in a lake inside a basin near the Martian equator, almost 100 miles from where NASA's Opportunity rover lies today. It is considered as one of the youngest lakes and thus probably one of the last liquid water sources to ever occur on Mars, the scientists report. The discovery is thrilling for the vision of ancient Martian life, clarifies main author Brian Hynek who is a research associate at the Laboratory for Atmospheric and Space Physics at Colorado University-Boulder: Hynek said "Having a later stage of water on Mars is probably a good thing for the potential for life on that planet because it gave life more time to be conceived. There was life on Earth when this lake was active so by that analogy, we can say there's potential that Mars had microbial life and this was a great place where it could have resided." The scientists are studying the age and source of hundreds of salt deposits across Mars to map how much water was present on the surface of Mars. Using imageries taken by NASA's Mars Reconnaissance Orbiter, which has been circling Mars since 2006, the group studied the land and geography around the basin. They found evidence to propose that at one point, the lake developed large enough to fall over the rim of the basin, creating channels in its wake. The scientists outlined these channels to adjacent volcanic plains hundreds of miles away that are nearly 3.6 billion years old. As the water channels created by the lake over-cut the volcanic plains, they must be younger. That points towards the fact that the lake must also be younger than 3.6 billion years. Thus far, this lone lake is the only proof of water on Mars about 3.6 billion years ago. 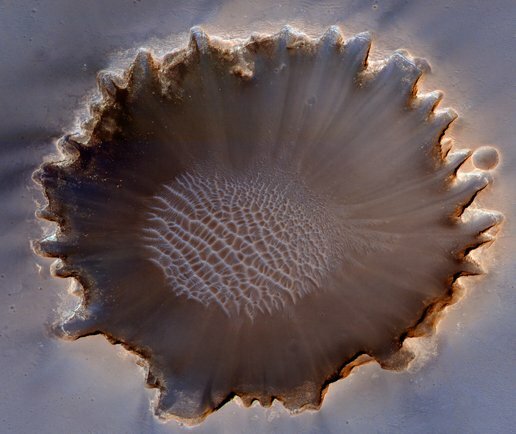 Hynek plans to carry on studying these salt deposits to learn if there's more indication of water on a younger Mars.